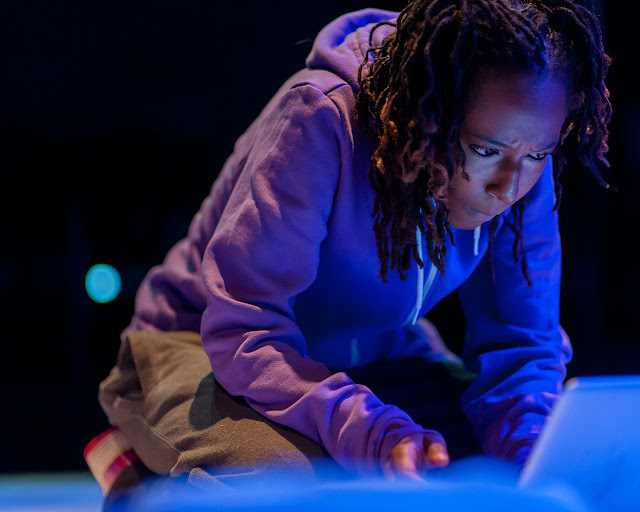 The story is formulaic and the music breaks no new ground. So why did we love "Daddy Long Legs" so much? 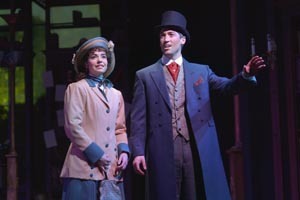 1) The two leads (Hilary Maiberger as Jerusha and Derek Carley as Jervis) are magnificent, together and apart. Many songs are classic duets, but in others a unique background vocal arrangement brings the two characters together even when their locations are far apart. It is hard to over-emphasize how effective this is. 2) A two person cast can be deadly if the two actors have little chemistry together. This is not a problem with Jerusha and Jervis. But boy do they make us wait for that first kiss. 3) John Caird's book, adapted from the more-than-100-year-old story by Jean Webster, is perfect. Caird is no lightweight, having written the books for Les Miserables and Candide among others, and he is a master of understatement. There is only one moment, in Act Two, when we feel the action drags, and that is probably the fault of the one song in the show that is excessive ("Charity"). The boy is in love. The girl is in love. No time to stop and sing about it. Chop chop. 4) Paul Gordon gives us songs that stick with us, like "The Color of Your Eyes," "The Secret of Happiness" and "Christmas in Manhattan." 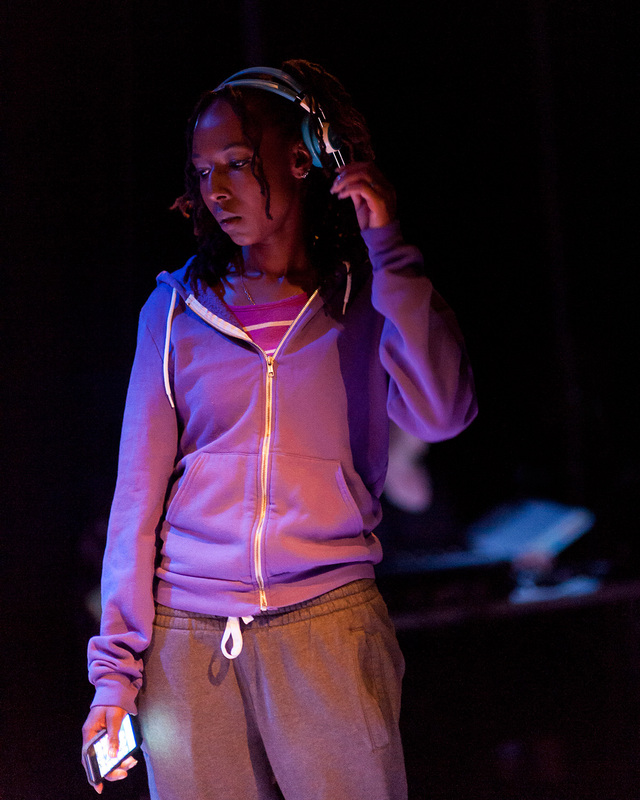 But, in the end, it all comes down to beautiful performances by -- (See No. 1). 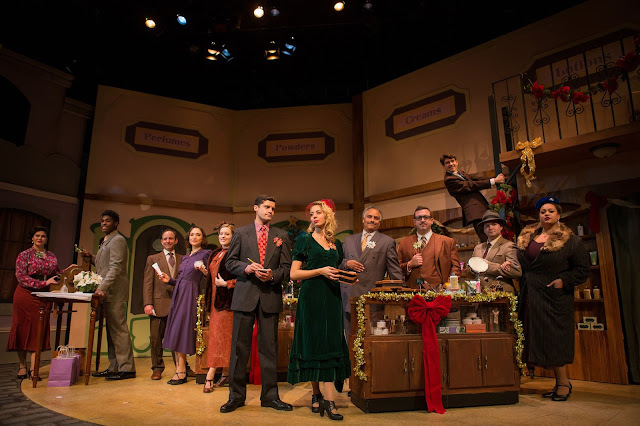 The San Francisco Theater Blog Awards Division is delighted to put "Daddy Long Legs" under the mistletoe. You will love the production as much as the performances. Sidle up and give us a smooch. You'll be glad you did. One Star each for acting, writing and music, with another for Fumiko Bielefeldt's perfect period costumes add up to: FOUR STARS! Jerry Bock and Sheldon Harnick's musical "She Loves Me" ought to be entitled "She Loves Me First," because we know that they went on to write the music and lyrics for the incomparable "Fiddler on the Roof." But they wrote "She Loves Me" first. 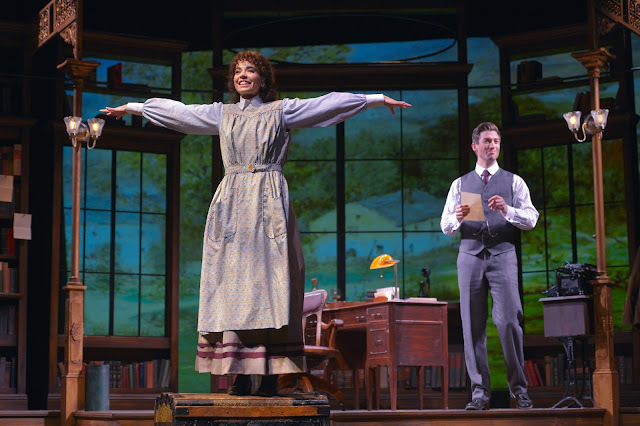 If there is one problem with the season's new San Francisco Playhouse musical production it is a lack of memorable songs. There is cleverness, and a lot of wit in the humorous numbers, but you will search in vain for "Sunrise, Sunset" or "Tradition." 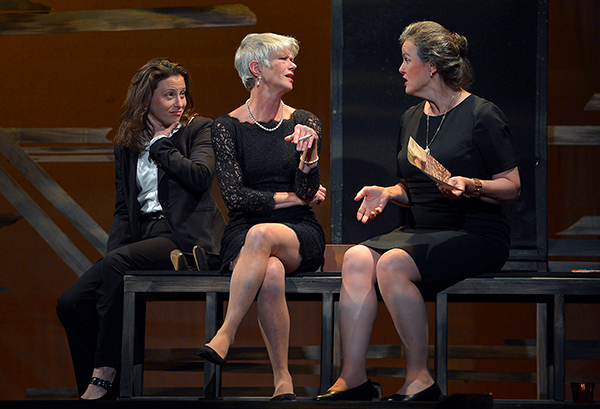 We enjoyed watching Katrina Lauren McGraw (above, left), alone or in ensemble. 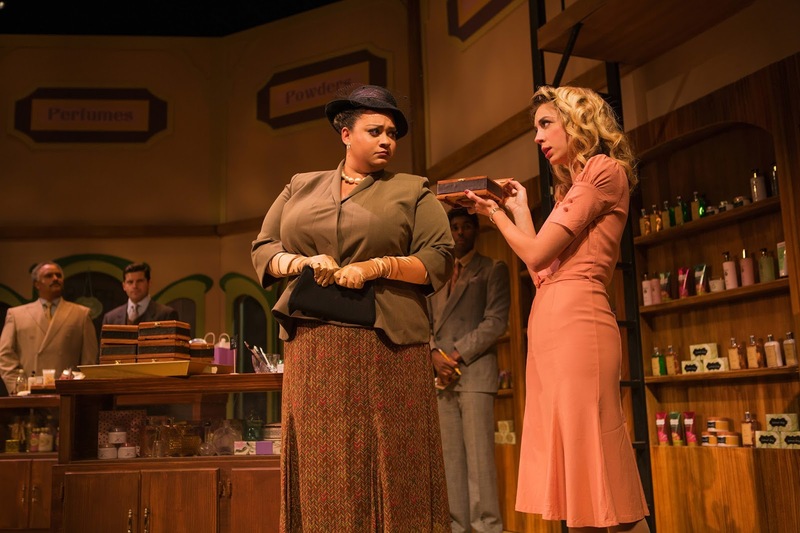 Nanci Zoppi (below, right) is a standout as Ilona Ritter, the shop girl who longs for romance. Zoppi has a loopy stage presence that counteracts the cool of some of the others. Jeffrey Brian Adams plays Georg. Georg loves Amalia (Monique Hafen) and Amalia loves Georg, but, you know, a lot has to happen first. 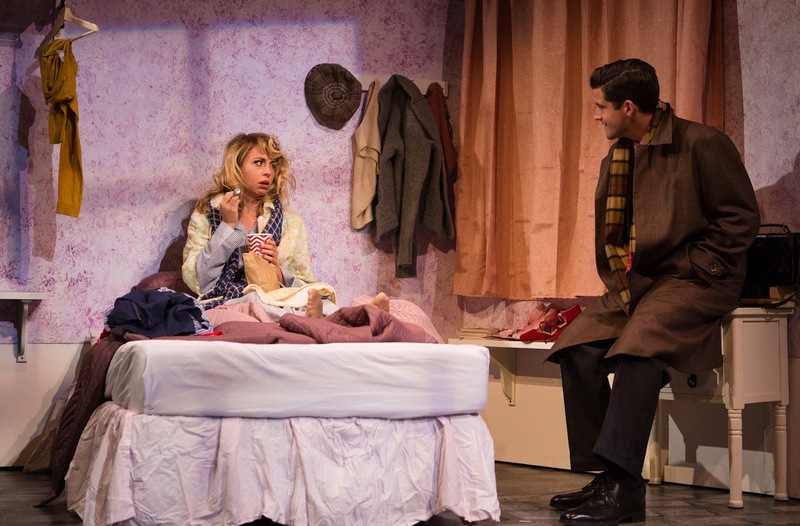 Adams plays his usual under-motivated, detached role, while Hafen is at her absolute best when they take the wraps off and let her be Luci Ricardo, like in the delicious "Where's My Shoe?" and "Vanilla Ice Cream." We applaud the decision to utilize live musicians and place them where we can see them play, instead of in a pit or, worse, using a pre-recorded track. This makes all the difference in the world. There were some unfortunate squeaks but we will take the small pains to enjoy the larger pleasure. 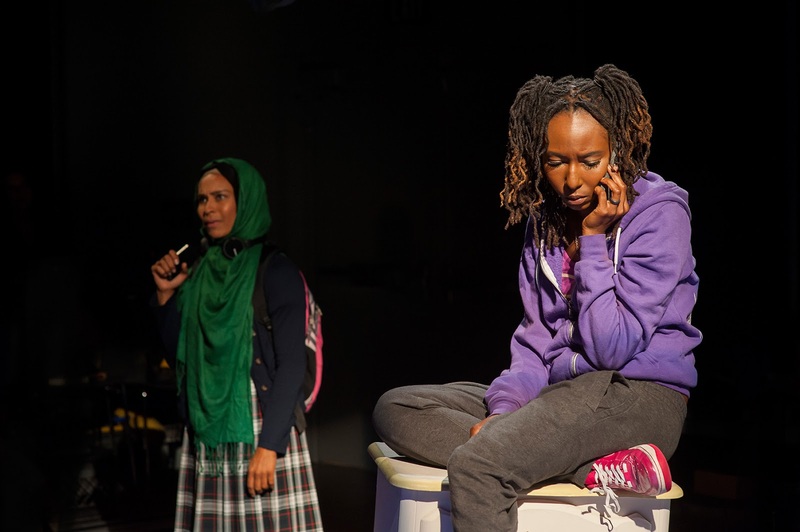 The ensemble of Katrina Lauren McGraw, Leah Shesky and Ayelet Firstenberg are standouts. And we always love Joe Estlack. The musical good-bye each shopper receives upon leaving the store reminds us there was a time before Amazon. 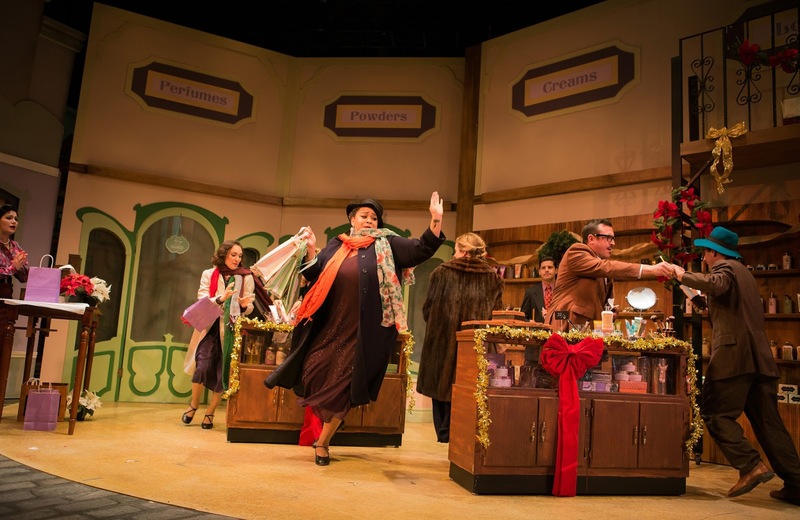 Each season, the San Francisco Theater Blog Awards Division looks forward to the Christmas musical at San Francisco Playhouse. These days, we all need escapism. 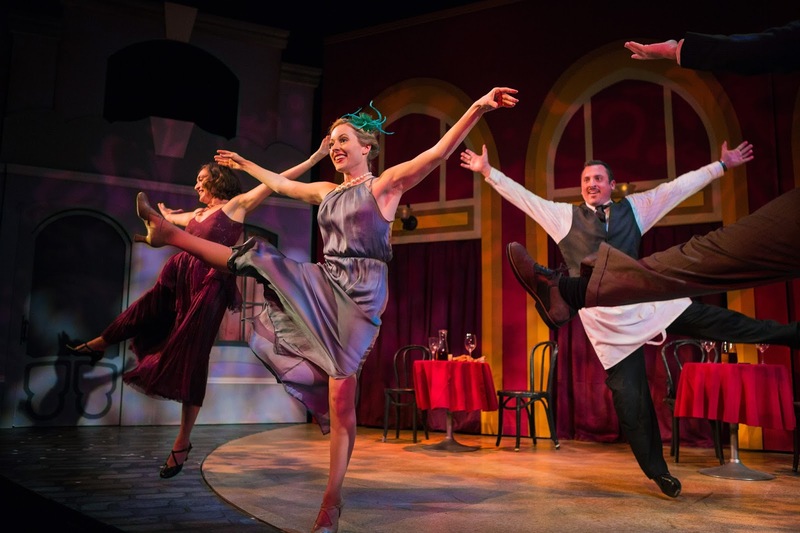 In our opinion, though there are lots of things to like about "She Loves Me," we can't help wishing the music grabbed us more. TWO STARS with a BANGLE OF PRAISE for making us wish shopping was still this much fun. This reviewer drove through the traffic to Marin Theater Company with a sense of dread at having to see yet another Jane Austen story. Enough English foppery, enough aristocrats, enough, enough enough! But surprise, oh ye Doubting Douglas! 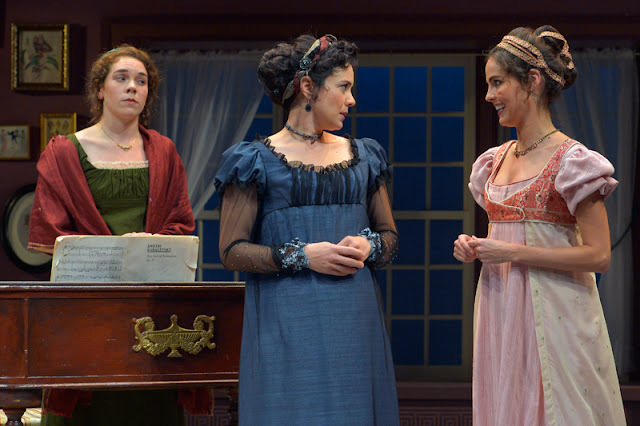 The World Premiere of Lauren Gunderson and Margot Melcon's "Miss Bennet" reveals the very reason we go to the theater: to be surprised and elated at the power of great writing and beautiful acting. 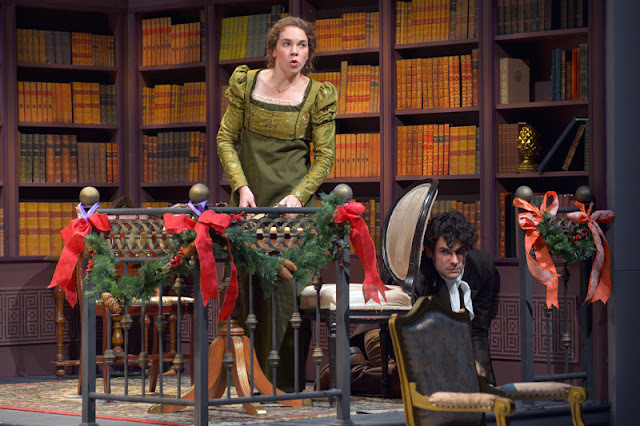 Where "Pride and Prejudice" stopped, Gunderson and Melcon take over. 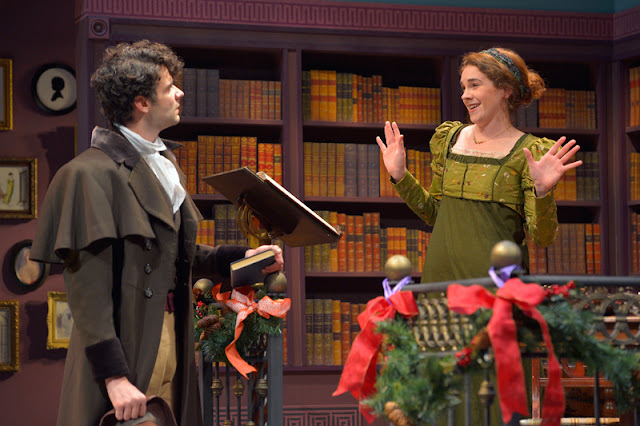 The last remaining daughter, Mary Bennet, unmarried and consigned to a rural life where her only companions are her books and her pianoforte, has arrived for a family Christmas at Pemberley, the estate where elder sister Lizzie has settled with her husband Mr. Darcy. 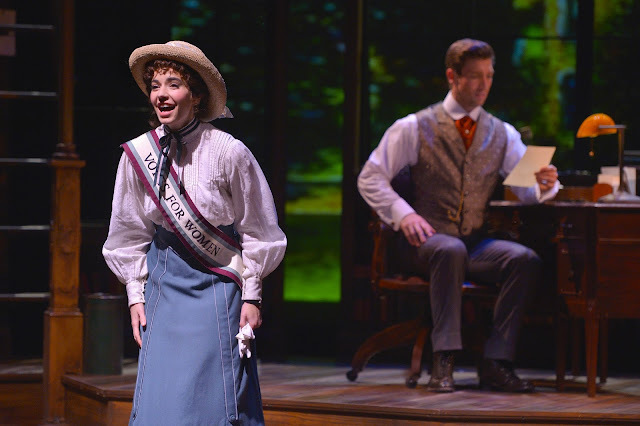 We find that Mary, boring and unappetizing where Jane Austen left her, has received a shot of Lauren Gunderson and become a modern, capable, brilliant and attractively independent female. Martha Brigham plays Mary to our delight, alongside Adam Magill as her equally out-of-place romantic interest Arthur de Bourgh. Magill is a young Tim Burton, tall and possessed of a cornucopia of facial expressions, mostly variations on the theme of bewilderment. 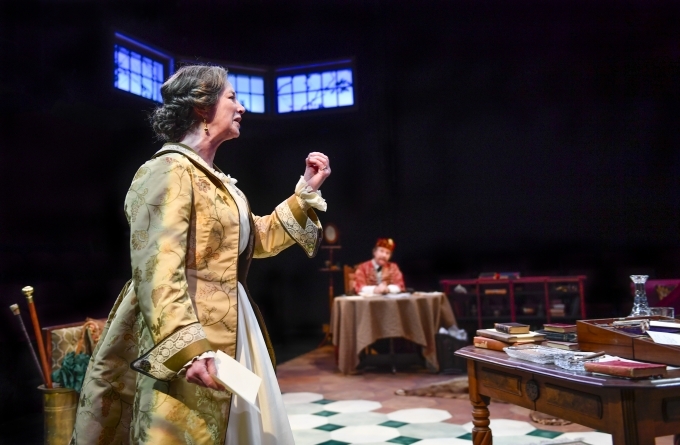 Brigham brings Mary a delightful wistfulness under her guise as resigned spinster. That Mary and Arthur will get together is unquestioned; the question is can these romantic bumbleheads pull it off in only two acts. We love the entire cast. 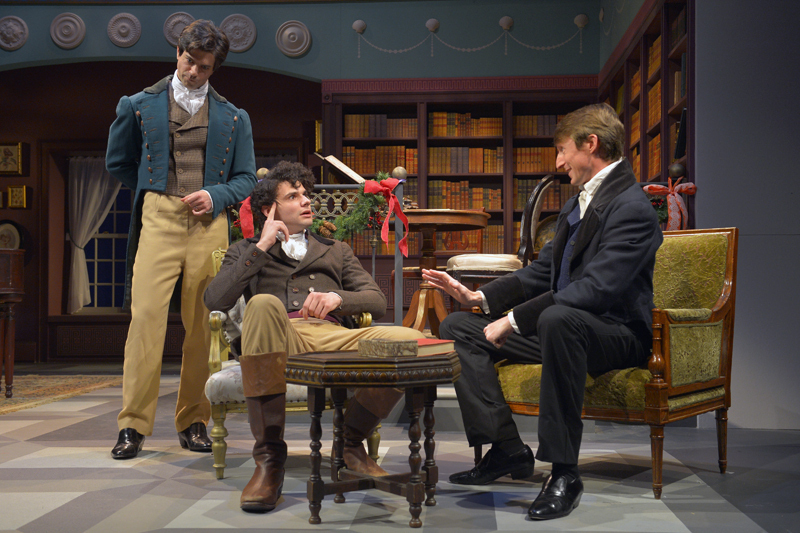 The two married brothers-in-law, Mr. Darcy (Joseph Patrick O'Malley) and Mr. Bingley (Thomas Gorrebeeck) are perfect as gentlemen itching to have anything at all to do. They delight in taking poor Arthur under their wing. Laura Odeh plays Anne de Bourgh, who in the Jane Austen story was jilted by Mr. Darcy when he chose to marry Lizzie Bennet. Now, she is back and about to get jilted again, but not until she gets in her licks. The San Francisco Theater Blog Awards Division, recently relocated into the Two No-Trump Tower, awards "Miss Bennet" Four Stars. Everything works. Acting, directing (Meredith McDonough), sets (Erik Flatmo) and costumes (Callie Floor) could not be better. 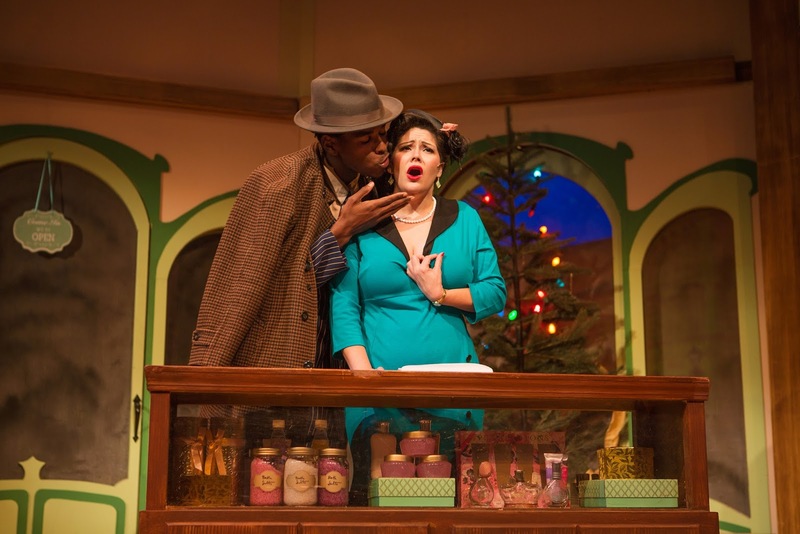 Those with November hangovers can receive a welcome December tonic at Marin Theater Company. 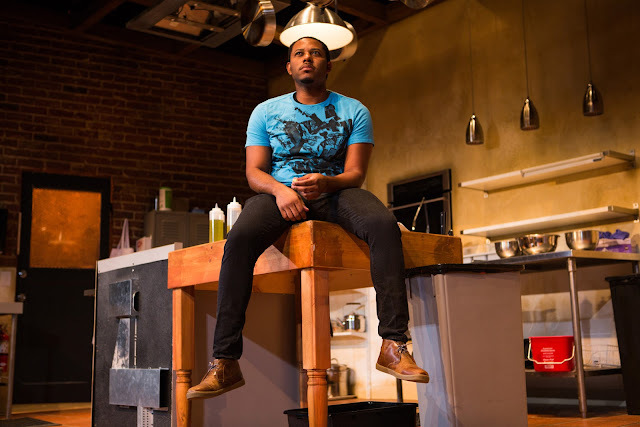 Richard Montoya's new play "Nogales: Storytellers in Cartel Country" gives us humor, melancholy and sadness, coupled around the rantings of Sheriff Joe Arpaio of Maricopa County, Arizona. Arpaio is the nationally-known advocate of severe justice for every illegal immigrant he can get his hands on. Joe Arpaio is played brilliantly by Montoya, who starts off answering questions by a reporter (Sean San José) about the questionable murder of a Mexican teenager, shot to death on the Mexican side of the wall, though the shots were fired from the American side, through the border fence. Arpaio takes off on every question and runs it into his own delusional world. We don't know if Joe Arpaio is really like Richard Montoya portrays him in this show, but even if he isn't we would pay money to see this guy right here. Montoya struts, he shows off to his acolyte assistants, he threatens and all the while manages to stay under control and sound almost reasonable. San José's character, the reporter, not so much. He is kind of a priest, but closer to a street person. 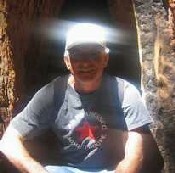 He has heart, but little personality, so he has no chance of standing up to Arpaio. Think Trump and Jeb Bush. The action takes place inside Arpaio's office in Nogales, but this could be any border town. We are given no sense of place, although Nogales appears to have been selected by -- whom? -- as a town into which to funnel illegals, and thereby capture them more easily. There are so many difficult questions to be considered here. Some more detailed discussion would be very helpful. There are side stories presented which give us excellent performances by Eliana López, Laura Espino and Carla Pantoja, but their purpose to the central issue, which is what is going on with Joe Arpaio, is unclear so far. 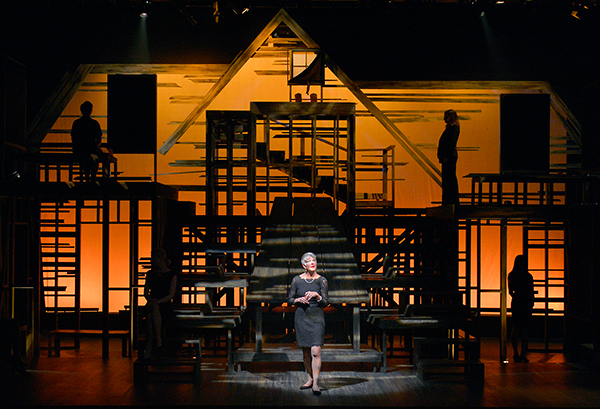 We love Tanya Orellana's Scenic Design and Juan Amador's Sound Design. Amador is onstage as well and he looks good in a cowboy hat. "Nogales" is new and has wrinkles to work out. 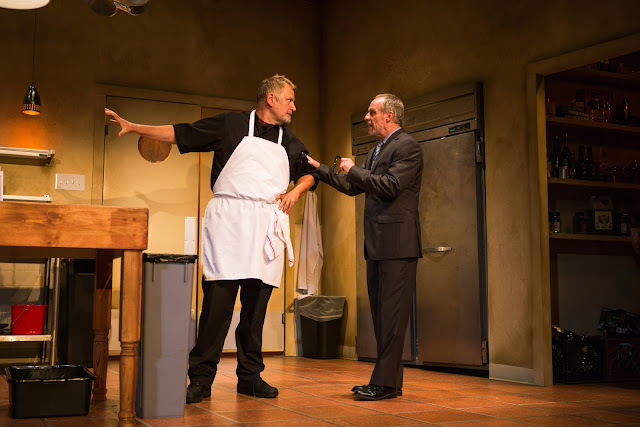 Right now The San Francisco Theater Blog Awards Division awards the show Two Stars with a BANGLE of PRAISE for Montoya's performance as Joe Arpaio. 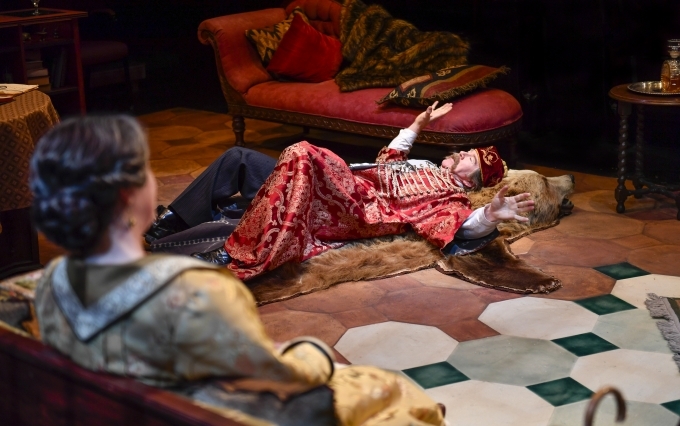 There is excellent acting and a promise of some understanding of an impossible situation. But we are still looking for a story. If we are going to spend so much time with the sheriff, we would like to know more about him than that he is one vato loco. 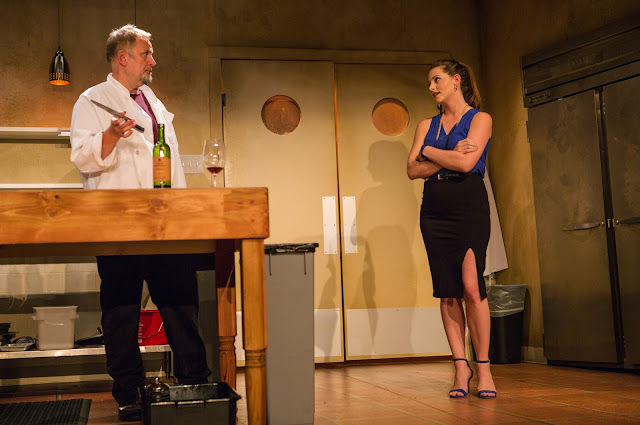 "Nogales: Storytellers in Cartel Country"
Playwright John Patrick Shanley has a Tony, an Oscar and a Pulitzer sitting on his mantel (does a Pulitzer sit on a mantel? ), but his romantic comedy "Outside Mullingar" is one you won't want to miss. It has a lot of "Moonstruck" in it (also written by Shanley), only instead of big-city Italians this time we get rural Irish. It is one of those rare evenings at the theater when you jump up and cheer at the final curtain and wish you could see the whole thing again. 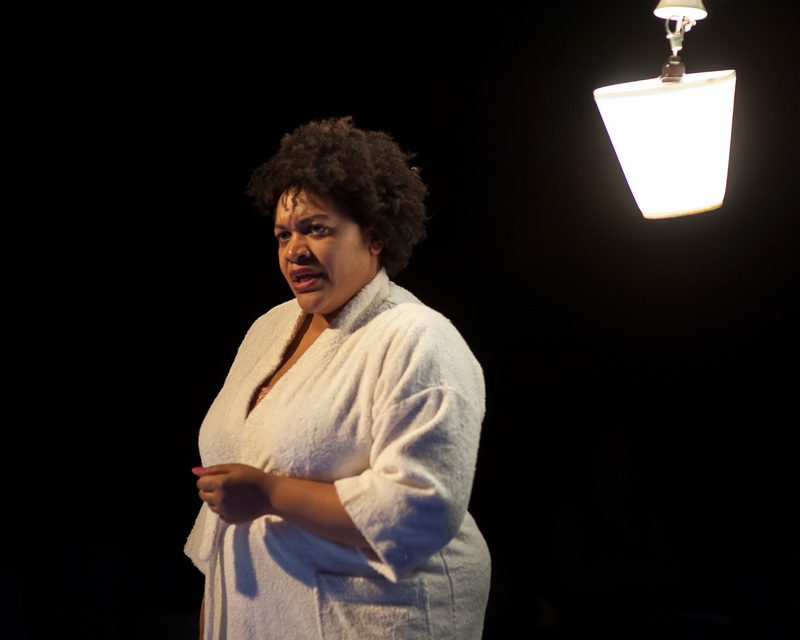 Jessica Wortham doesn't make her entrance until the second scene but she grabs this show and runs away with it. 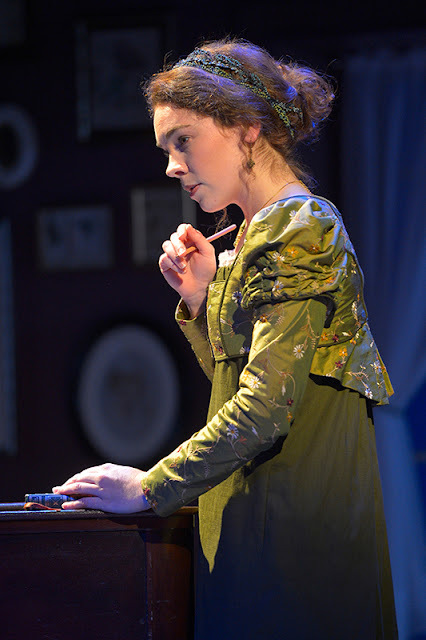 As much as we loved her as Kiddo in "Upright Grand," this is a role she was born to play. 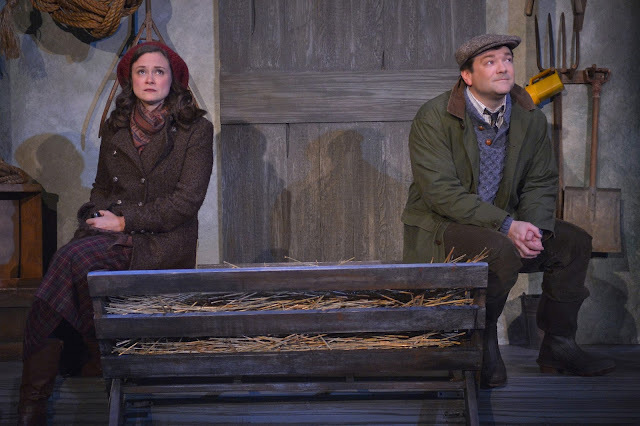 As Rosemary, the neighbor daughter in the Irish farm village, she gives us grand physical humor along with expected rain-spattered Irish melancholy, all delivered with a brogue that, one supposes, is only acting. She fooled me. She has been in love with Anthony (Rod Brogan) forever, but he is as passive as the grass. There is a long-standing family feud engendered by Anthony's stubborn father Anthony Sr. (Steve Brady), which centers on a patch of ground sold by him to Rosemary's father, the late and lamented Mr. Muldoon. 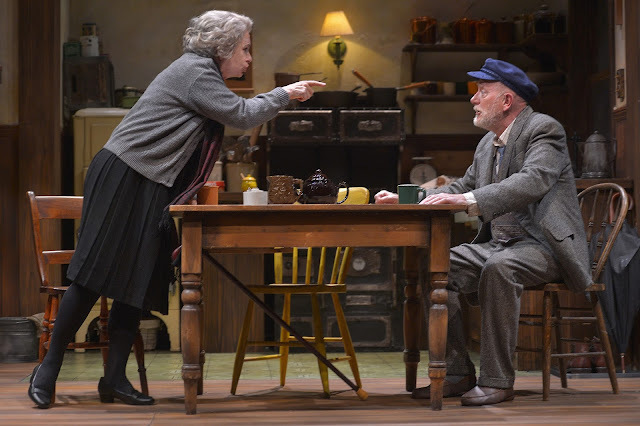 Lucinda Hitchcock Cone plays Aoifie Muldoon, Rosemary's mother, who delivers quite a few of the show's great lines, like "Don't think! Thinkin' is worse than February." "The only reason you own that land is love and spite." 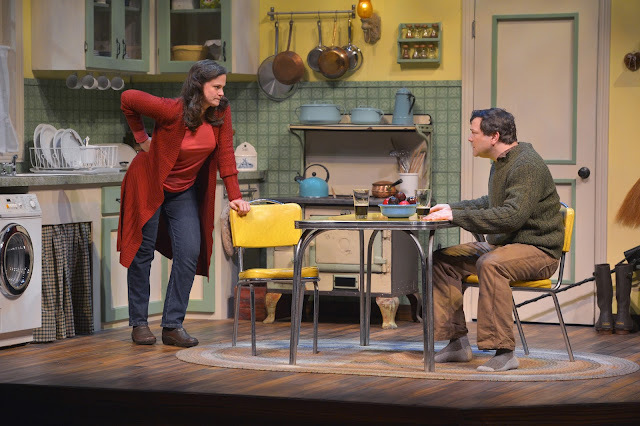 Robert Kelley's direction is perfect, and the combination of set (Andrea Bechert), costumes (B. 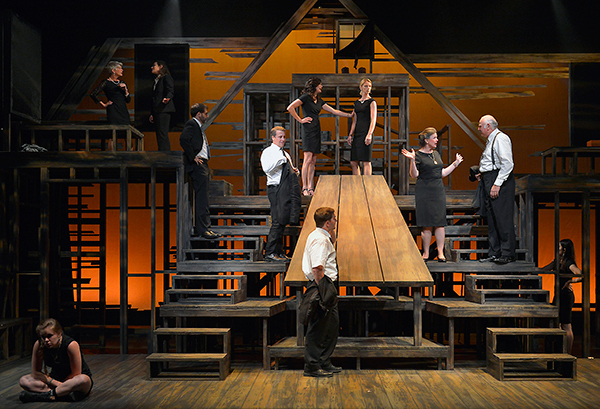 Modern) and lighting (Steven B. Mannshardt) make us feel like we have been teleported from Mountain View to Mullingar. The show is funny and heartfelt. We can't recommend it more highly. The San Francisco Theater Blog Awards Division feels "Outside Mullingar" has everything a Five Star Show has, except for featured music. Fill me with fiddles and harps, lads, and a five-star we should be havin'. Lacking that, we award FOUR STARS with a BANGLE OF PRAISE, our next-highest rating. 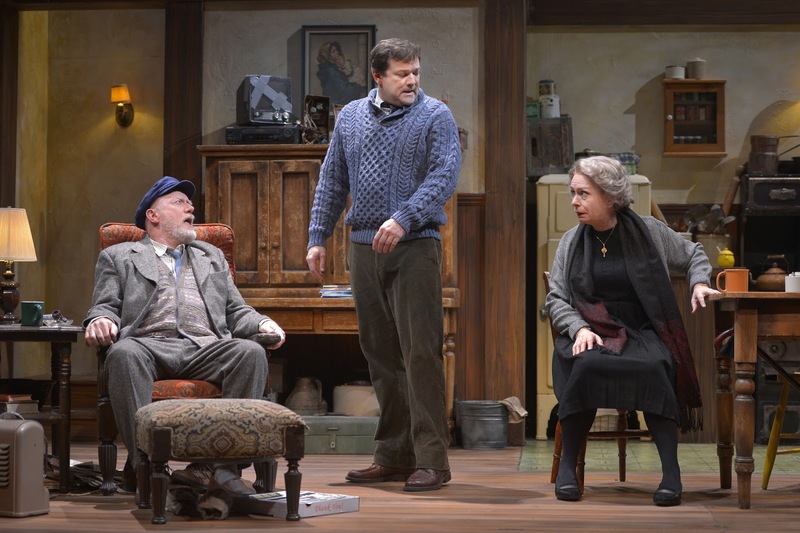 "Outside Mullingar" make us remember why we go to live theater: a story that moves us with actors who make us laugh and cry. It seems simple when done so perfectly. The Southside Theater uses the room across from the Magic Theatre in Fort Mason. Acoustics and sightlines are good. 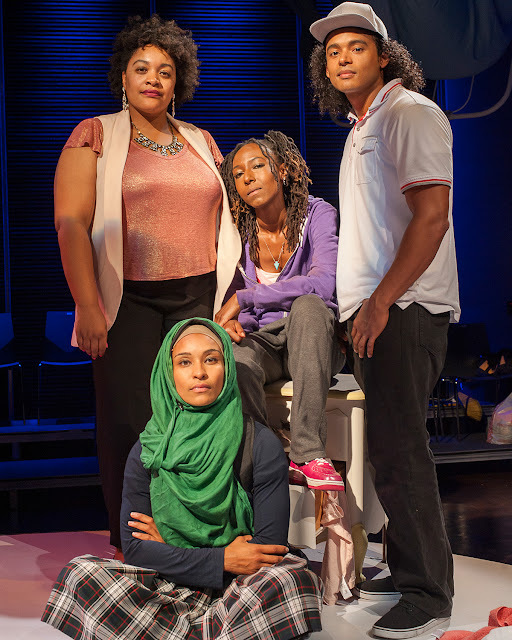 This is important for Rita Abrams and Josie Brown's adaptation of "Pride and Prejudice," which features a seventeen-person ensemble under Lexie Papedo Gasparini's direction. There isn't a lot of space on that stage for all those people so every movement counts. Somehow, they manage to pull it off. 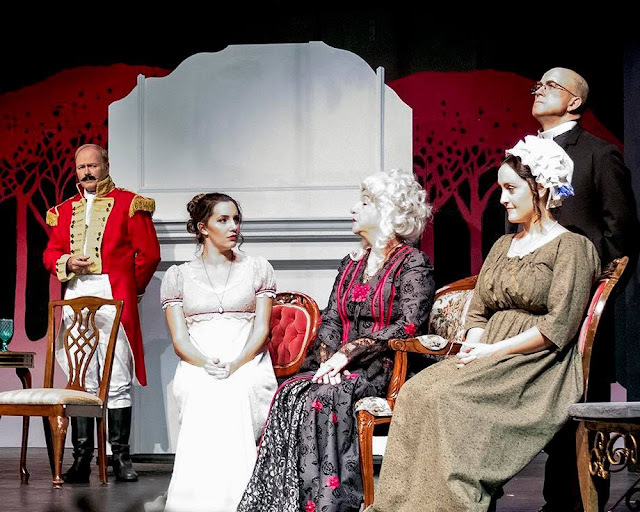 The ensemble contains excellent singers, including Brittany Law as Elizabeth Bennet, David Crane as Mr. Darcy, Lizzy Moss as Jane Bennet and Fernando Siu as Mr. Wickham. Poor Mr. Wickham only gets one number but could probably use more. The Jane Austen story is familiar to everyone who knows the genre: young Englishwomen faced with the choice of marriage or poverty. Aristocracy is evil, the middle class is good, husbands are useful for their income and wives serve to promote the husband's standing. Cash is good but inheritance is better. Ms. Abrams writes clever lyrics with simple melodies. 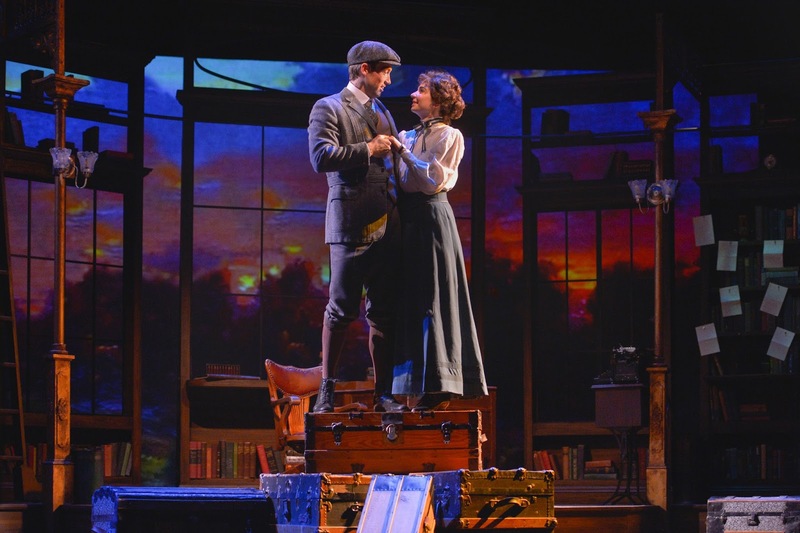 We especially enjoyed "Five Daughters," "A Husband" and "The One Who I Will Be with You." 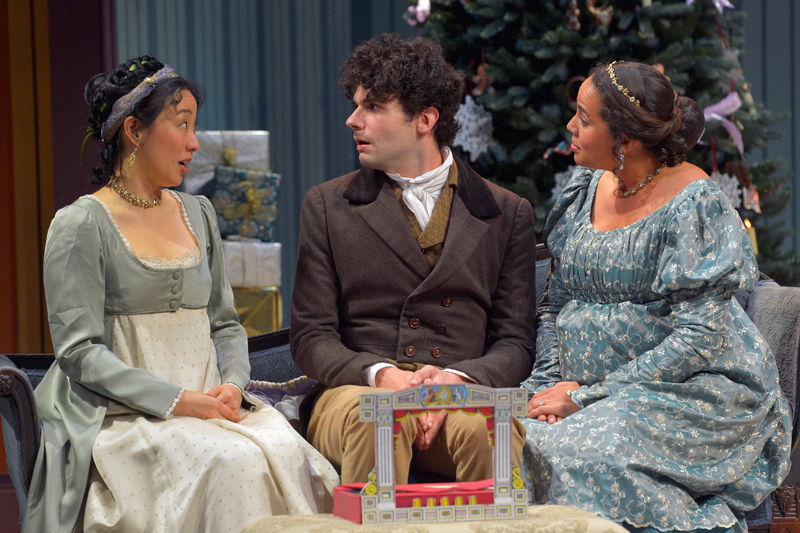 "Pride and Prejudice, The Musical," is a lot simpler with less psychodrama than the original Jane Austen novel. For this and for an enjoyable night at the theater, we thank Josie Brown and Rita Abrams. The San Francisco Theater Blog Awards Division finds "Pride and Prejudice, The Musical," difficult to rate. 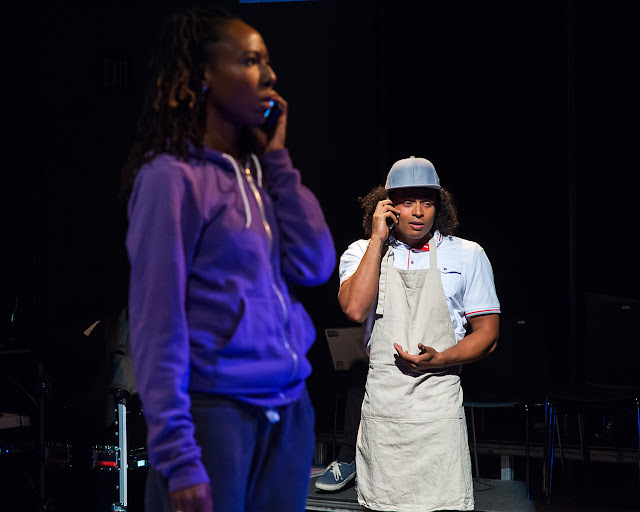 In some ways it feels like a local theater production where production and casting decisions are limited. But in other ways this production is the equal of others with far greater resources. 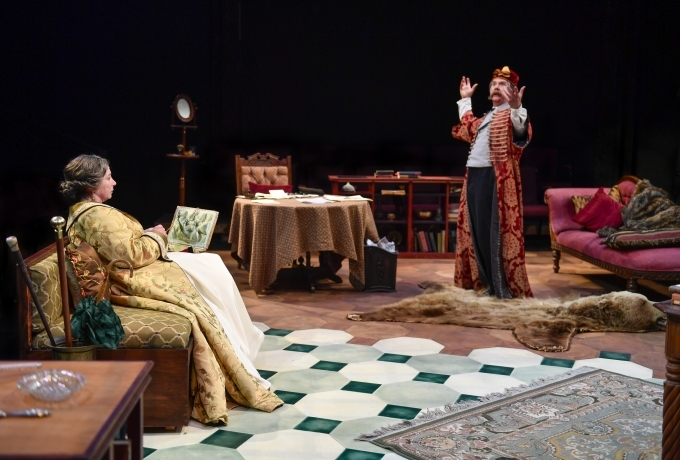 The cast is excellent and there are standout performers in the principal as well as non-principal roles. The songs are catchy and we exit the theater singing. 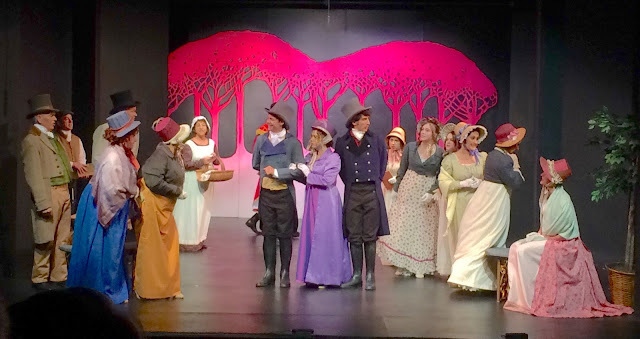 Three Stars for "Pride and Prejudice, the Musical." 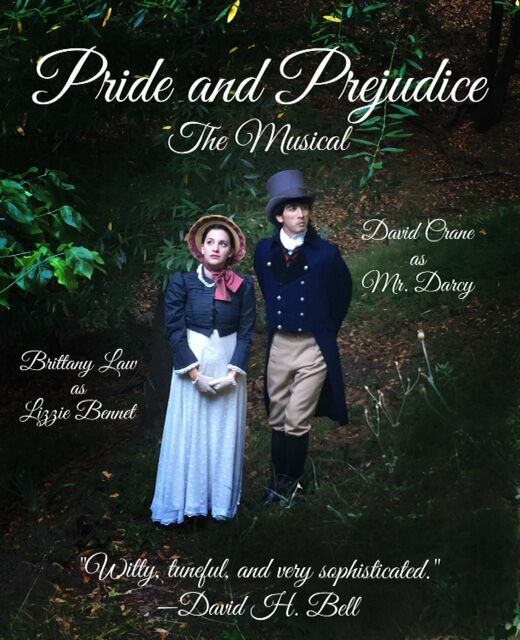 "Pride and Prejudice, the Musical." 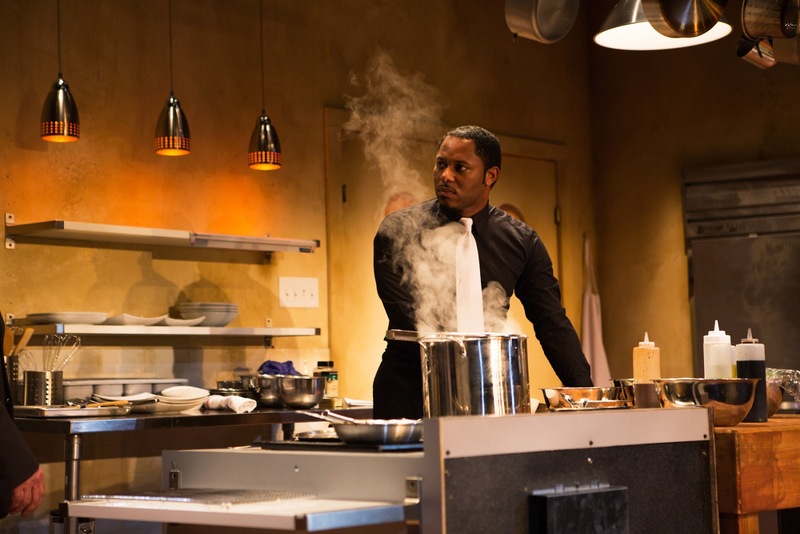 Theresa Rebeck's brand new "Seared" takes us inside a restaurant kitchen. It's hot and loud and it smells great. 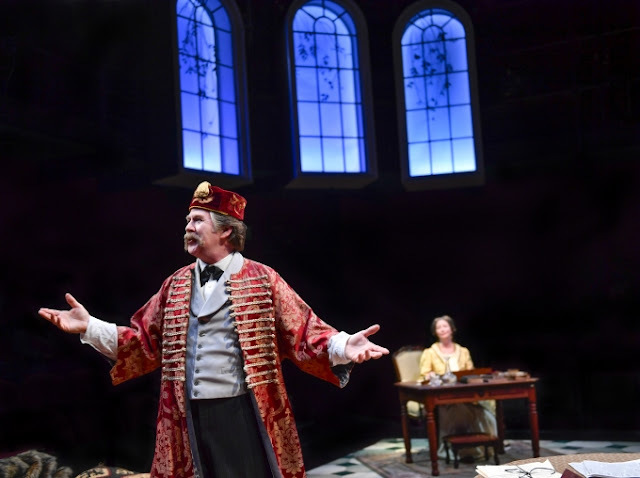 San Francisco Playhouse commissioned this show three years ago and Rebeck has rewarded their faith. How can you not like a plot that includes donuts and bacon? 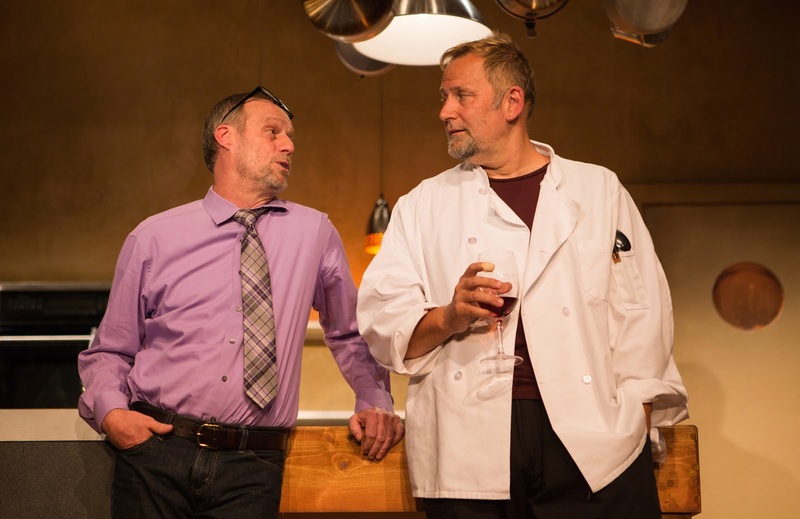 We love Brian Dykstra as Harry, the part-owner of the Brooklyn restaurant. He is the chef, bullheaded, but alive with ideas and a genius with food. Harry is the artist and his partner Mike (Rod Gnapp) is the money. Where it comes from we would like to know, because Mike's money is not unlimited. 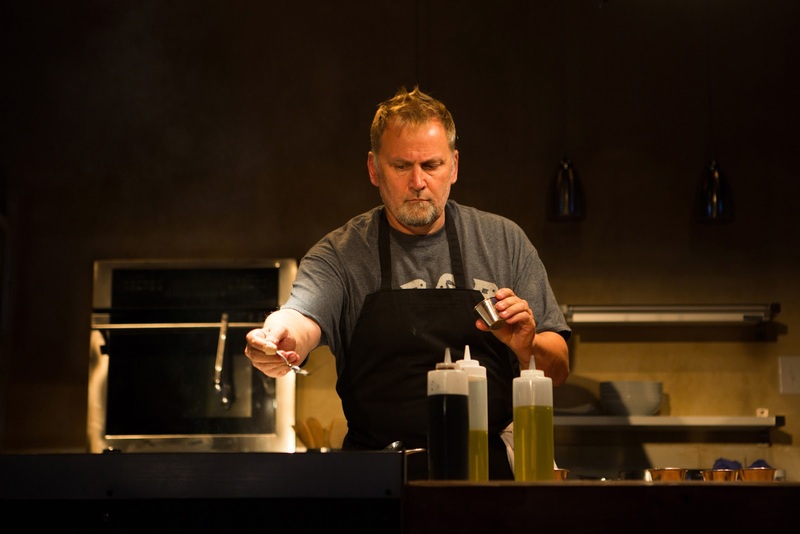 Due to a variety of issues familiar to all restaurant owners, the business is failing, despite a recent excellent mention in New York Magazine. Long time waiter and friend Rodney (Larry Powell) is forced to be the referee during Harry and Mike's constant shouting matches. His is the one voice of reason in this kitchen. 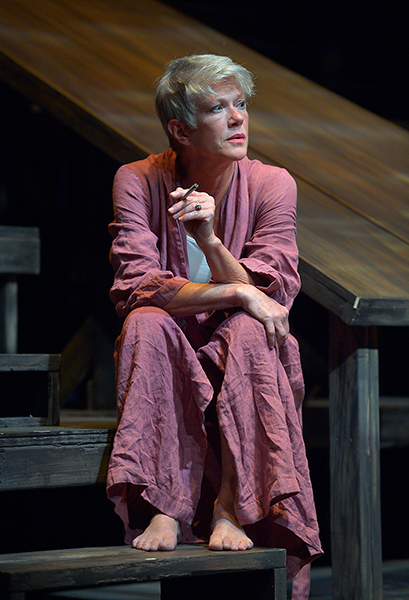 Enter Emily, played by Alex Sunderhaus. She is the food-services consultant, whom Mike has met the previous night in the restaurant. Alice's advice and contacts just might save everyone. But she herself is as unstable as a souffle. 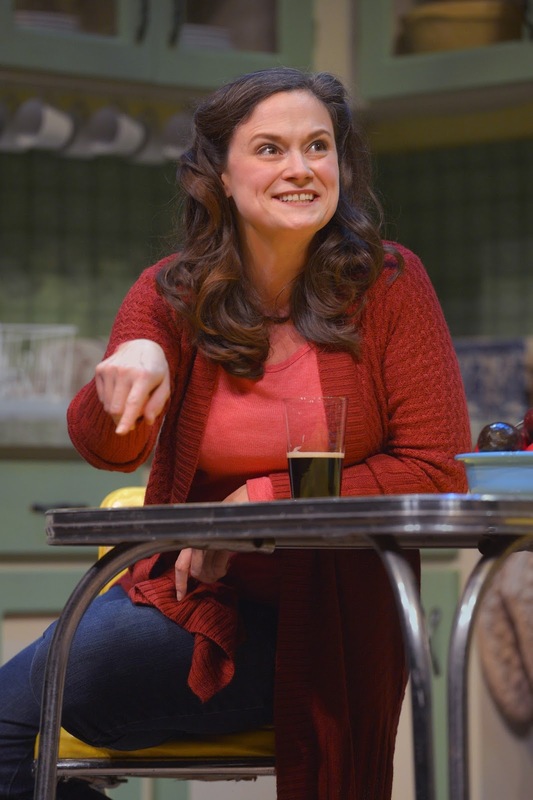 Rebeck's dialogue is sharp, the issues real and they really are cooking bacon on stage. "There are an infinite amount of doors that can be opened with butter," says Harry, one of our favorite lines. But we think the author can add more. Our biggest problem is with the character of Emily. She is awfully young and high-heelish for a kitchen. 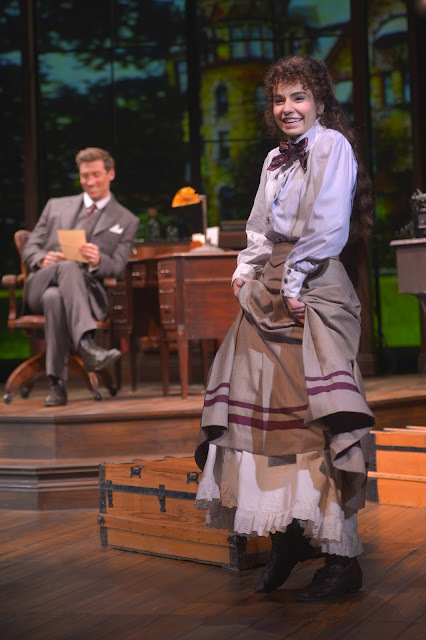 Act One ends with a tiny sprinkle of flirtation. Is this it? Emily's motivation is unclear. It might be blind ambition. Or something else. We'd like to know. The San Francisco Theater Blog Awards Division understands this is a World Premiere with many different spices available to continue to season the sauce. 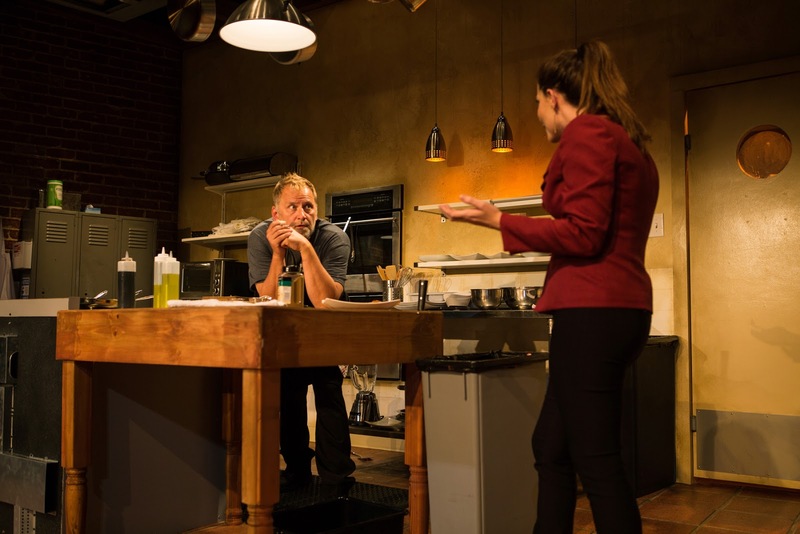 We give "Seared," which may turn out to be one of Rebeck's best plays, Three Stars with a BANGLE OF PRAISE. Filled with sharp dialogue and a fascinating glance into a world about which we know little, it will go higher. As always, stories come down to people. Harry and Rodney, we get. Mike, we pretty much get. Emily, somewhat less. And what about friendship? What about loyalty? Is there a bad guy here? THE BANGLE is for Larry Powell. His Rodney is spot on perfect, compassionate but realistic. And the man can cook. They all can.